When I was a kid I watched the Incredible Hulk on TV and was totally captivated when a mother lifted a car off her trapped son to save him. It was illogical and unlikely that a simple human could lift a car and yet totally plausible that a mother’s love and determination could do the impossible for her child. Last night I saw what a mother’s and Father’s love accomplished. And it took my breath away. I had the privilege of attending the dedication of Demekia Suleman’s Habitat for Humanity home. If you’ve never experienced this – well you are missing out on a wonder. People spilled out of the house onto the porch. There just wasn’t enough room inside for everyone who came to celebrate this moment. 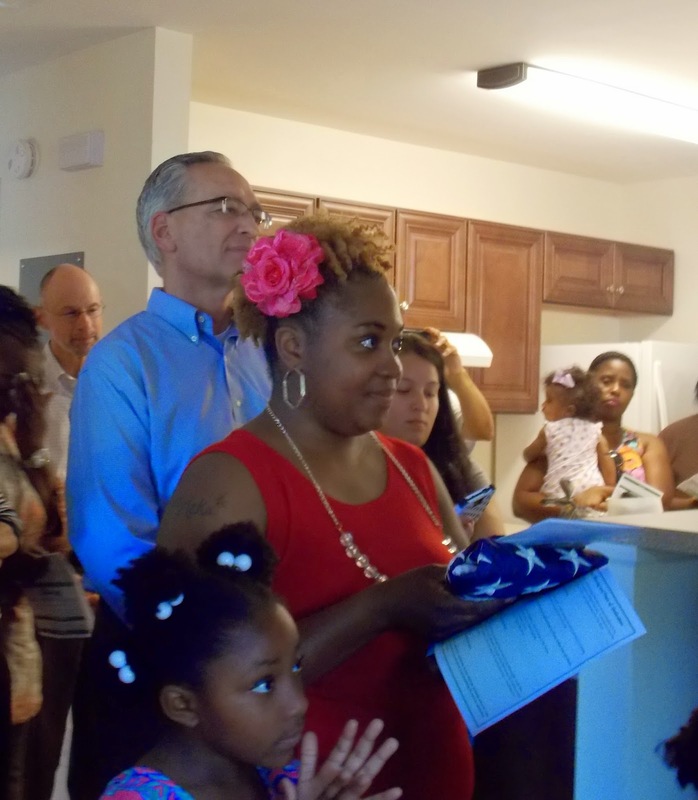 Inside, Demekia stood quietly with her children, surrounded by friends, family, Habitat for Humanity staff and other volunteers. Demekia was calm and beautiful as the dedication began. 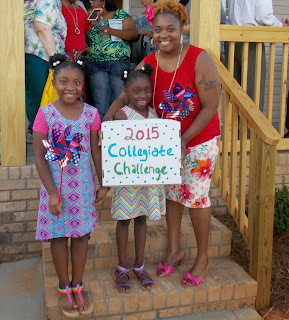 One of the schools from the Collegiate Challenge gave her a wall hanging and Demekia began to smile. Her smile grew wider as she received the Bible from Doug Stafford with the Habitat Board of Directors. Demekia’s smile reached her ears when she received the keys to her home. The whole room took a deep breath as Demekia accepted the little pieces of metal that mean she is a homeowner. Then Pastor Cecil Brown led us in the blessing of the house and well, I felt the Spirit move. We were in the presence of something big, something beautiful, something incandescent. Love burst forth in that room in an explosion of pure joy. Words fail. Seriously. Cannot do it justice. Then Ms. Clodfelter with DAR presented Demeka with an American Flag and reminded her that this is Memorial Day Weekend so she could put her flag up – that – THAT was the moment it became real for Ms. Suleman. She, Demekia Suleman, owns a home. And she can fly a flag, have a barbecue, put up seasonal decorations, entertain family, and raise her children in a safe, clean, beautiful space that she worked for, sweated for, and prayed for. Demekia’s smile never wavered even as tears filled her eyes (and a few others’ too). It felt like Christmas morning when Santa brought your first bike. It felt like a wedding day. It felt like the birth of a child. It felt like a miracle. This miracle came about because hundreds of people gave time, effort, and money in small and large amounts to a cause. To Habitat for Humanity. To a family. I still believe a mother’s love can perform amazing feats of strength. Last night I saw a mother and Father’s love lift a family and raise a house.